– and we still don’t know if it will work, and probably never will. 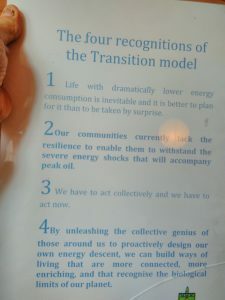 This blog is by Naresh Giangrande Co-founder of Transition Town Totnes, the first Transition Town, and of Transition Training. I am leaving Transition Network after a ten year, white knuckled ride of extraordinary beauty and passion, alongside some of the most caring people on the planet. My part began with Rob and I beginning Transition Town Totnes, and then carried on with me (and Sophy Banks) taking on Transition Training at TransitionNetwork.org It was hard work for sure, but brilliant, redeeming and punctuated by a lifetime’s worth of ‘I can’t believe this is happening’ moments. I feel such gratitude for what this movement has given me and all learning even the hard lessons. Rob and I both realised in the early days of Transition Town Totnes (TTT), the need for deep, far reaching systemic change in just about every area of life (at least for those of us in the global elites which is just about everyone reading this). I still stand by that. I doubt if we were even able to think in those terms. The terminology was probably not available yet, or I was unaware of it. There was no name for what we were proposing. It was bold, imaginative, and beyond what most folks thought of as environmentalism. It wasn’t environmentalism, it was much more than that. Much more. 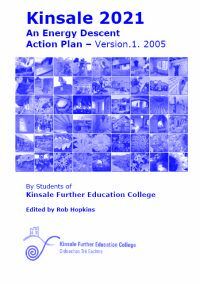 We took a very simple concept that Rob and his permaculture degree course at the Kinsale college had come up with which was an energy descent plan. Rob and his students applied permaculture design principles to a problem – peak oil and climate change. And they came up with a design for how Kinsale could plan its energy descent. It was a very simple response to a knot of physically and psychologically complex predicaments. It set the scene for our work in Totnes. We asked the question, could this student project become something owned by and run by a place? ie Totnes? It started a revolution in how individuals could make a difference. It created pathways for social change to happen in a peaceful, non violent way. We drew on many who has come before us – consciously and unconsciously- from Mahatma Ghandi’s Satyagraha, Gaia Theory, Resilience and Complex Adaptive Systems theory, Strategic Niche Management, Joanna Macy, Christopher Day and many others – and applied them to real world problems, in the place we live. As we are all, in some sense, part of the problem, we invited people into an uncomfortable experiment. What would it be like to live both as the problem and a potential solution? And of course being an experiment, you have no idea if it will work (whatever that means). Lesson 1 -You don’t have to know what you are doing before you do it. And the experiment took off and spread far and wide, with the help of the then fledgling internet. As we open sourced everything, others copied and did their own version of Transition. Some of the first you tube videos of a Transition Town talk was done by a group in New Zealand who we never met before but obviously had seen our work. It was one of our many, ‘How did that happen?’ moments. Lesson 2: Open source is to human knowledge what genetics and environment is to evolution. As a complete outsider in social change maybe I could see things others couldn’t. And maybe we just got lucky. I certainly didn’t know what we were doing. We just did what felt right and we had lots of, mostly welcome, reflections from critical friends. 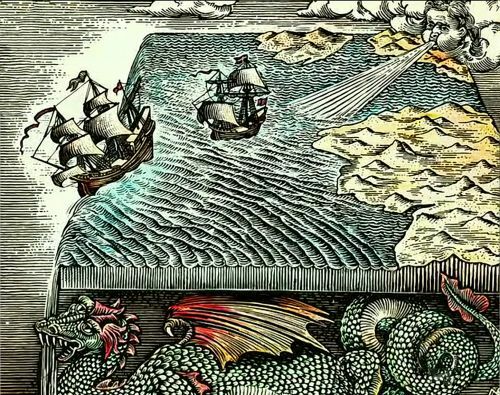 One of the early critiques of Transition was from a group called the Trapese collective, which argued that we didn’t name and confront the enemy (hint, capitalism) as our starting point, therefore it wouldn’t work. “The Rocky Road to a Real Transition”: A Review. There were many others, which often took the view that we were not doing it right because we were not doing what they thought we should be doing, in the way they thought we should be doing it ( “too fluffy”, “too middle class”, “too white”, “too nice”). And there were many others who joined us, or copied us, or cheered us on. I certainly never did anything like this before. I was CEO of an enterprise which provided landscaping services. Me and my (now ex) grew tired of cutting grass, maintaining golf courses, and making rich people’s gardens. There had to be more to life. And Oh my God was there! Lesson 3: Hack your life before life hacks you. One of the most important changes happening in society was the internet had grown up in tandem with the Transition movement. In one of the early open spaces that seeded the early Theme groups in TTT where we were exploring food, we advertised that folks could take part over the internet. We posted onto a wiki site, some of the questions that people came up with in the Open Space, and Martin Crawford posted on the wiki (www.agroforestry.co.uk ) cautioning us about replanting forests and orchards with Devon species as climate change was making French varieties much more viable in the changing Devon climate. Wow! It works! Who would have thought? But those were in the days where the Internet was open and free and small folks like us had visibility and a voice. Lesson 4: The internet was pure freedom, at the beginning. For some reasons, freedom is usually transitory. During the early days of Transition, the peak oil community took root, expanded and began to influence the cultural narrative of resource scarcity. Veterans like myself might remember Theoildrum.com. What began as a small self reflecting space exploded after Hurricane Rita into a cultural critique free for all. Peak oil and Climate change pushed its way into mainstreamed consciousness. And we hitched our wagon to the peak oil narrative big time. Climate change was too distant to be convincing to all but the more thoughtful amongst us, but peak oil provided an instant ‘this not only has to change it will change, and faster than you ever thought possible’ narrative. No waiting until 2030 when Miami would be underwater because of climate change, it’s happening now, blind siding us all except the peak oilers. We knew what was happening. We were the special ones. There were some voices of caution that perceived a deeper more balanced appreciation of inner and outer Transition. But in the stampede for recognition those voices got drowned out. The days of late 2007 and 2008 created a tsunami of interest from a civilisation which could not comprehend what was happening and we not only provided the analysis, we also crucially provided the solution. 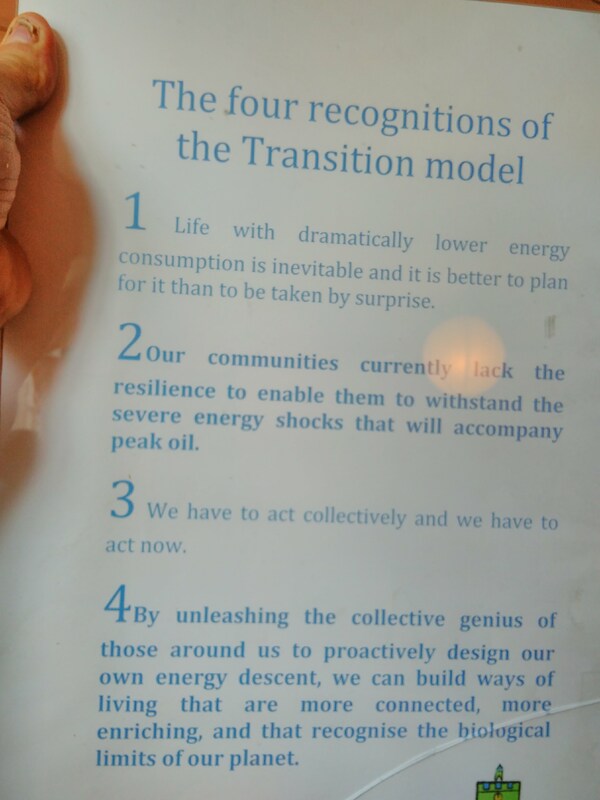 Our simple message: relocalise now and start your personal and community energy descent. Lesson 5: Provide simple, easy to understand, and follow, messages. People will love you for it. Each day we came into the TN office we looked at each other in disbelief at today’s oil price, and then the phones started ringing, and ringing. And we gave interviews and talked and heck even the popular BBC radio soap opera The Archers created a Transition group. (It soon died.) More recently, Erik Lindberg of Transition Milwaukee has written some really good critiques of the Transition narrative and I think we need to pay attention, a few years too late maybe. 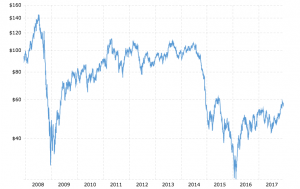 On July 3rd, 2008 WTI (West Texas Intermediate- a benchmark crude oil) hit $147/ barrel. And just as night follows day, after the boom came the bust. And as fast as the interest materialised, it de-materialised. And I think we were guilty of buying into ‘the change is coming now, so deal with it’, although trying to maintain a measured approach that made common sense. Media does do subtly well, and I think this got lost. And with the bust came, I think, a loss of credibility. Lesson 6: You will only get one shot at predicting the zombie apocalypse, so you better be right. Our credibility, especially in the USA and Canada was in tatters, and made worse but the belated waking up of the oil industry to the realisation that a bunch of nobodies was setting the public agenda on energy, and maybe they needed to do something about that. And they did. It was helped by mass deployment of fracking, which enabled the oil industry to set up the new narrative, “Peak oil? Nonsense!, fracking has got it covered, good old American enterprise has done it again. Don’t worry about it, find something else to keep you awake at night”. And so it came to pass. In thinking about it, we should have taken and maintained a more nuanced story, which emphasised the Theory of Anyway, centered on well being, and how building resilient communities is an important part of personal well being – anyway. Transition is a slow and steady process. Maintaining the resilience of Transition groups long term should have been, and should still be, our focus. It appears that we will need to be around for a long time to create the sort of change or be ready for the sort of change we are wanting to make. 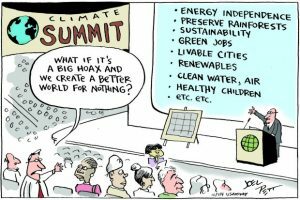 I think a lot of groups burnt out with the urgency of the task, and the sense that we might, just might, be able to stem destructive climate change and that the time for change was/is now. It has become increasingly clear to me that we need to cultivate our gardens (literally and figuratively) cultivate personal resilience, and play a long game. I have always said I don’t think I will live to see a world, that we can say with some confidence, is on a sustainable, regenerative path. And I still stand by this. Lesson 7: Creating deep systemic change is a long slow process, if something appears to work like magic it probably won’t. Sophy and I have often said to each other, that we have had the best jobs in Transition. This is because we have had the unbelievable privilege to be in many deep, reflective spaces with some of the most wonderful, caring people on the planet. In the very early days of Transition training we set off on a world tour. Our aim was to exponentially spread the Transition model and practices, reflecting the exponential spread of the movement. We witnessed the birth and acceleration of Transition first hand in many places; the USA, Canada, New Zealand, Australia, Hong Kong and Japan. And that spread is down to people coming together and setting out a vision full of insight, inspiration, and creativity. And then doing something about it. This has always given me hope, because Transition is what we do together. As Margaret Mead said, “Never doubt that a small group of thoughtful, committed citizens can change the world; indeed, it’s the only thing that ever has.” And I still stand by that, I have not yet seen a better more worked out pathway to creating systemic change as the Transition model and practice. 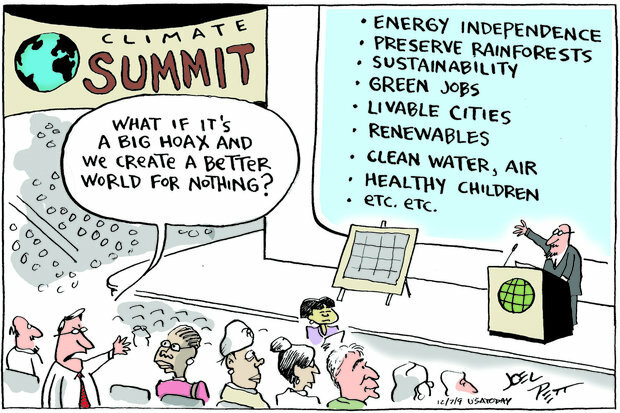 There are many things wrong with Transition, or solutions not yet created. There will be more on that in my next, and last post for Transition Network. Our four recognitions are still, despite much water under the change theory bridge, about right. The change we still need to create is a far reaching, system changing, Overton window* stretching, redefining, uncontrollable, leveraging, one step at a time, constantly re calibrating, learning and relearning, well being determined fudge. In other words we don’t know what we are doing or how to do it, or where we are exactly going. Yes, we have some ideas, and yes we (and others) have learned quite a lot. 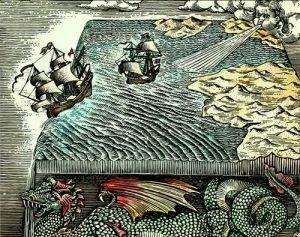 But I think we are as clueless about what our world is going to look like in 50 years time, and how we are going to get there, as the medieval explorers who set off from European ports hoping the earth was not flat. My final admonition, don’t fool yourself into thinking we have the answers. We don’t. And I still stand by that. Thank you thank you thank you to all who answered the call. And those who will. * Overton Window – The Overton window, also known as the window of discourse, is the range of ideas tolerated in public discourse. Thank you, Naresh, for all your highly creative work over all those years. I agree with this: “Maintaining the resilience of Transition groups long term should have been, and should still be, our focus.” I salute everyone who is applying this to real world problems, in the place they live. That’s a bold and brave way of life. Naresh my dear friend, Everlasting gratitude for the incredible idea that you and Rob gave birth to and brought us to this extraordinary adventure that is to make the transition to a more human, united and meaningful world. As you unknowingly changed the course of my life when you created the movement in 2005, I can say that we will forever be linked by love and this wonderful social fabric that is the transition network. I hope that the universe will gather us always and on good occasions. I’m sending my love to you and to Sophie. Thanks for a thoughtful and reflective article. May I comment on some of your points? 1. NARESH: “In the very early days of Transition training we set off on a world tour”. I was one of the participants in your and Sophie’s course at Bowral on the NSW Southern Highlands. They was days of learning and living together with people from Brisbane to Melbourne along Australia’s East Coast. After the course, the metropolitan group, Transition Sydney (it auspiced local transition groups by providing economical public liability insurance to cover events as well as a networking function) continued its work for some years. So did transition groups elsewhere in Australia as the idea took hold in peoples’ imaginations. Because my partner, who was also at the course, works with mainstream citizens in her work in local government as a sustainability educator, and because of my work, we found the Joanna Macey techniques taught at the course unsuitable. We substituted techniques that came across as less challenging and threatening to people. Macey’s techniques retain value for use with the right groups. 2. NARESH “ …those of us in the global elites which is just about everyone reading this”. With the globalisation of poverty and disadvantage with the spread of neoliberalism, the global elite is no longer resident in any particular country but is found in both more-developed and lesser-developed countries worldwide. Poverty, disadvantage and discrimination is now a property of more-developed nations where in most cases it is growing in number. Were anyone to attenpt to do so, classifying people as part of the global elite based on country of residence or ethnicity would be erroneous and rather outrdated. 3. NARESH: “Maintaining the resilience of Transition groups long term should have been, and should still be, our focus”. This raises the question of duplication. With Transition Towns’ base in permaculture, my take on why transition groups faded in prominence in Australia was because of their attraction to permaculture practitioners as a practical application of permaculture ideas. The Southern Highlands course, for example, constituted approximately 50 percent permaculture-trained participants. The proportion of permaculture people in other Transition Towns groups may have been higher. There was too much duplication between Transition Towns and permaculture. With permaculture more established here (where it was invented) the inadvertent competition led to a decline of Transition Towns. Groups still exist, as do websites and social media, however overall the Transition movement went into abeyance. This is unfortunate because many of those non-permaculture people attracted to Transitions were people of high capacity, broad experience in mainstream organisations and who could spread such a movement to sectors unattainable by permaculture.. This brings up your idea of nurturing groups, something Sophie addressed at the Southern Highlands course. I have participated in a range of civil society organisations like permaculture, new economy and urban agriculture. Of all these, it is permaculture associations which I find the most challenged to maintain some organisational resilience in. This comes down to personality factors and an inability to work in groups. What other factors contributed to declining participation in Transition Towns in Australia? • mostly, though, I think it the overlap with permaculture and its appeal to permaculture people, its main recruitment base perhaps, that was a main cause. Thanks again for a thoughtful and analytical article and for your contribution to a better world.